Make sure Outdoor Play is Fun & Safe! Whenever the weather allows, you’ll find children outside. Do they understand potential electrical hazards and how to stay safe? Talk to about it, so children and other family members know to have fun and be safe at the same time. Children often do not understand the dangers of electricity. Take some time to get down and view the surroundings from a child’s vantage point to locate possible hazards. Stay away from electrical equipment on the ground and overhead. Never climb a utility pole or tower. Don’t play on or around electrical equipment. Electrical power poles and utility equipment should never be used as a playground. Never climb trees near power lines. Even if the power lines aren’t touching the tree, they could touch when more weight is added to the branch. 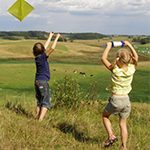 Fly kites and model airplanes safely away from trees and overhead power lines. If a kite gets tangled in a tree that’s near power lines, don’t climb up to get it. Contact your electric utility for assistance. Never go into an electric substation. Electric substations contain high-voltage equipment, which can kill you. Don’t retrieve a toy or rescue a pet that goes inside. Call your electric utility instead. Look up and around you. Always be aware of the location of power lines, particularly when using long metal tools like ladders and pool skimmers. Water and electricity never mix! Keep electronics like radios away from pools and hot tubs, and watch for overhead power lines when cleaning pools, sailing or fishing. Never install pools underneath or near power lines. Never touch an electrical appliance if you are wet; always dry off completely. Keep utility and emergency numbers close at hand in case an emergency arises. Be careful using electrical appliances outdoors. Whether it is a bug zapper, an electric charcoal lighter, or a radio caution must be exercised. Be sure you use outlets that have weatherproof covers and ground fault circuit interrupters (GFCI) to prevent serious shock injuries. Use portable GFCIs for outdoor outlets that don’t have them. Keep electrical appliances and tools at least ten feet away from pools, ponds and wet surfaces. Electricity and water are a dangerous combination even wet grass can create a hazard. Supervise the use of extension cords outside. Check them carefully for exposed wires; make sure they are in good shape, and not frayed or cracked. Use only extension cords that are rated and marked for outdoor use, and are large enough to handle the current needed for the device you are using. Check that the prongs on the extension cord plugs are clean, not broken or bent. Make sure the ground prong is intact in a three-prong plug, and avoid use of adapters. Do your part to prevent accidents by sharing important safety information with those you love.